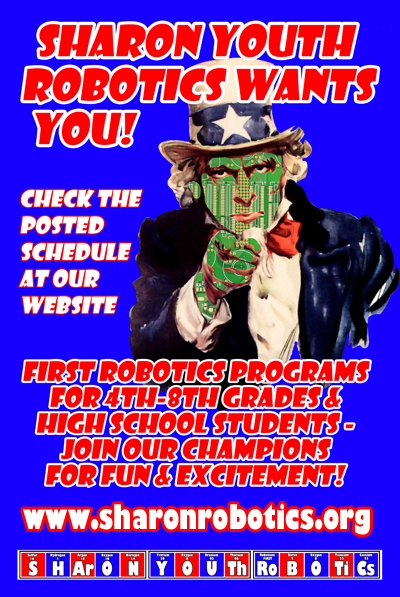 The Sharon Youth Robotics Association is once again recruiting and organizing teams to represent Sharon in the FIRST LEGO League (FLL, grades 4-8) and the FIRST Tech Challenge (FTC, grades 9-12), with the competition seasons starting in September 2018. Participating in FIRST (For Inspiration and Recognition of Science &Technology) robotics competitions fosters teamwork and technical skills, as well as being fun and exciting. State tournament competition can lead to the World Championships, where the SYRA has been represented frequently, sometimes by as many as three teams. The SYRA coaches and high school team members mentors teams in and around Sharon MA, as well as consulting with teams at greater distances. Team Unlimited (FTC0001, high school level) members also officiate at FLL tournaments in eastern and central Massachusetts. Please contact us if you are interested in participating, or want more information.